On order!! Will be here soon, still time to make changes to hull color, engine model, etc. Call for more details! !The latest design in the fabled Redfisher legacy, the new Redfisher 16 takes value and performance in a true backcountry boat to the next level. New features include more dry storage fore and aft, an advanced livewell system and better balance for ultra quiet skinny water stealth. A new console accommodates flush-mounted electronics and has a back-lighted fiber optic switch panel with lighted switch tips for easy low light operation. Matched with smaller power options to 115 hp and with a 21 gallon fuel capacity, the 16 has the range and speed to make shallow water runs far into the backcountry quickly, safely and economically.This easy-to-trailer, easy-to-maintain, easy-to-pole boat is not only a great buy with high resale value; it’s a comfortable, safe family boat as well. 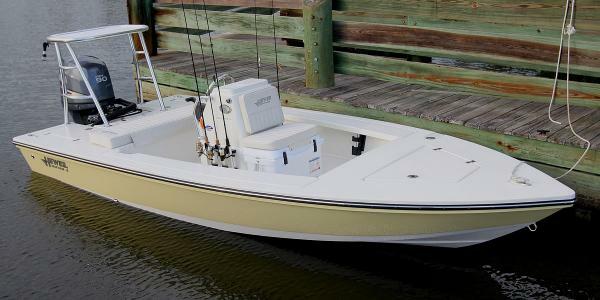 Add all this to Hewes’ legendary ride and unmatched build quality and the result is the perfect marriage of innovation, experience and economy.Call the guys at The Ships Chandler in Destin, FL for more details.